An exploration of love’s loss and life’s recovery from Stevenson (The Color Symphonies, 2014, etc.). This book, a combination of engaging memoir and unusual poetry, proves that quirkiness doesn’t preclude depth. The twin pole-stars of the work are simple objects—flutes and tomatoes—but its still life also includes a knife, a bottle of wine, and the interior of a small atelier in Paris. Composed in the immediate aftermath of a loved one’s death, this collection reveals the compulsive attention of extreme grief. In it, the author reminisces about a trip he took with his love, wandering the Loire Valley farms one glorious summer. But the only evidence of passion that remains now is a dozen tomatoes stolen from those farms, and the flute that the author’s love played so well. Faced with a sense of inertia, the author believed that grappling on to something solid might help: “The only thing that would make a difference would be if I could find some objective proof of love….if I chose an object of my affection and tried to understand it as no one had understood it before.” The subject was right there on the table, red and ripening: “William Blake said he could see eternity in a grain of sand. Why not in the seed of a tomato?” In Stevenson’s provocative verse, the fruits themselves connote a fleshy voluptuousness: “Tenderly, with blind / Fingers you touch the precious skin / As it swells and dilates / Like some enormous empty heart.” But beyond the author’s rich metaphors, the objective fact of the tomatoes drives the book’s credibility: “I have written so much about the tomatoes / They at last have become the REAL REAL.” In the end, the author penetrates his subject with a knifelike concentration, which grants him acceptance of his own plight; ready for a new start, he writes of going up the steps of his basement apartment into the busy streets of a new life. Readers should take a chance on this work, and not let the unusual focus dissuade them. 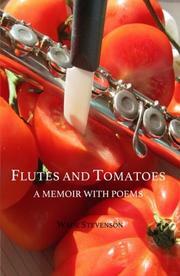 A paean to the tomato and a song of natural devotion.